The Boy Scouts of America is preparing to celebrate its 100th birthday in 2010. While the world of Scouting prepares for the festivities associated with the national centennial, another smaller and local centennial is also being planned and we welcome community members to become involved in this project. Congress chartered the Boy Scouts of America in 1910, but at the time Scout troops were already active in many U.S. cities and towns. One of those troops was located in Barre, and it came into existence in 1909, one year before the Boy Scouts of America was officially formed. A celebration is being planned for 2009 in honor of the city's 100 years of Scouting. Currently being considered are a parade and camporee, but the highlight of the celebration will be the dedication of a Scouting monument. This monument was originally designed in 1941 by the renowned Barre sculptor, Carlo Abate. 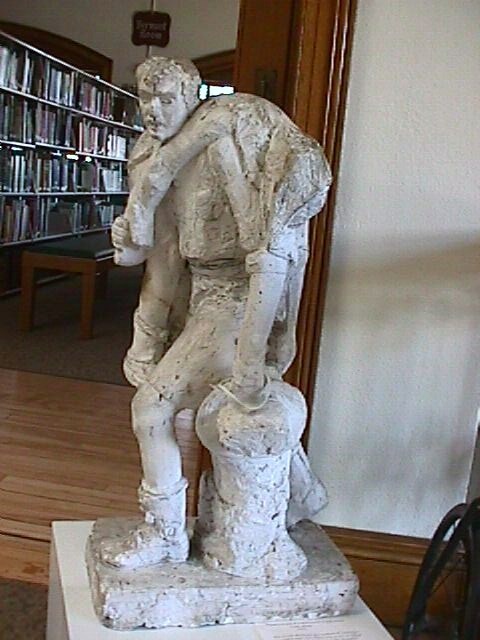 The model, currently on display at the Aldrich Public Library, features two Scouts demonstrating how to carry an injured comrade. Two local Scouts posed for the model, Leno Lavin and Idalo Masi. Unfortunately the sculpture was never completed. Our main objective will be to obtain the granite for this statue and arrange for some stone artisans to sculpt it. For more information, call 479-2787 or 476-4412 or email: scouting@butternutgraphics.com or hooknook@verizon.net.